The crowd is roaring and you can feel the excitement in the air! The game has ended its 4th quarter but the score is tied… everyone prepares for OVERTIME! There is a buzz in throughout the gymnasium… “Who is going to win?” Someone shoots… misses then a rebound… Now someone is at the free throw line. The crowd comes to a low roar but then as the shot is about to be made there is a frantic cry for a miss! The score goes up for one team and then the score goes up for the other team. There is a break away and a block… the clock is counting down the seconds… and then buzzer goes off. The score is still tied. OVERTIME once again! There is finally a break through and one team takes a lead. With the sound of this final and third buzzer Athens wins with a final score of Athens 77 Union City 71. It was once again another game for the record books! It was about 4 – 5 years ago that the boys Varsity Basketball Game between Athens and Union City went into multiple overtimes. The ironic thing is… the game was played at Athens and Union City won the game. This year the game was played at Union City and Athens won. But I remember that game at Athens all too well. I was not photographing it but instead I was a parent of a Union City Junior Varsity basketball player. We were watching the Varsity game to support his school team and fellow athletes. However, a part of me was also supporting the Athens team… you see, I am an Athens Graduate (1986). It is amazing now going to these games and photographing them. I’m not rooting for one or the other teams any more… but instead I am thrilled to be a part of documenting such a great rivalry between schools. Click here to see more photos from last nights game between Athens and Union City. One way I have found to capture a juxtaposition during a basketball game (actually during warm ups) is to capture the basketball as it comes thru the hoop and net. For me it is more of a comparison of technique, focus, position and timing. The shear timing alone can be extremely tricky but always such a delight when I capture that perfect moment in time! Congratulations, Jesse Anderson from Union City took first place at his home track invitational! Above you are looking at the new 8″ x 10″ Team Portrait print that you will receive when ordering a package containing an 8″ x 10″ Team Portrait or an individual 8″ x 10″ Team Portrait. All schools of the teams that I photograph will also receive an 8″ x 10″ Team Portrait for displaying in their school. Above you will find the new 5″ x 7″ Team Portrait print that you will receive when ordering a package containing a 5″ x 7″ Team Portrait or an individual 5″ x 7″ Team Portrait. Also, all coaches will receive a 5″ x 7″ Team Portrait of the team they coach. I am looking forward to an exciting and busy year of High School & Middle School Sports! Good luck to all of the teams that I am photographing… Athens, Tekonsha & Union City. You will also find me in Harper Creek this fall photographing athletes competing in Football & Volleyball. 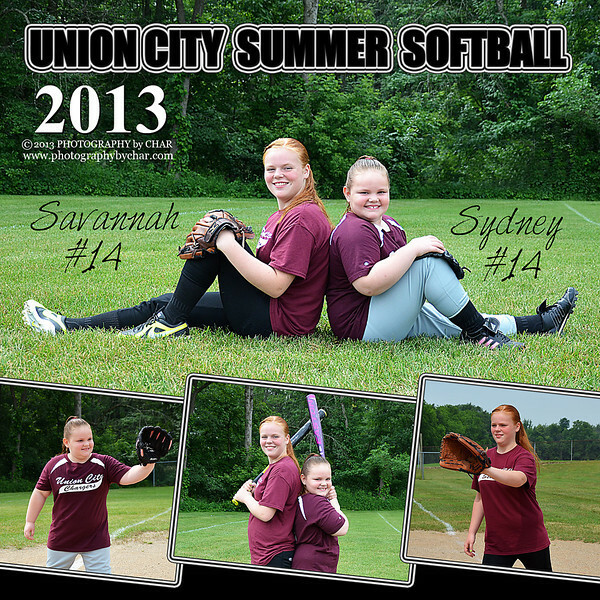 Savannah & Sydney both play in the Union City BUCKS Summer Softball League. I have photographed Savannah while she played several different sports over the past year, but this photo shoot really brought a new appreciation for her love for sports!